Here at Lensrentals.com, we have over 100,000 pieces of gear that we not only regularly rent out, but also regularly inspect, clean, and diagnose. Because of this amount of gear, we’re afforded the luxury of getting some pretty unique insight into the gear so many videographers and photographers use on a day to day basis. In the past, we’ve put together an investigative piece showing the equipment that most frequently needs to be repaired and why. We’ve also put together hundreds of articles breaking down equipment, showing you what is inside, and how lenses and cameras work. 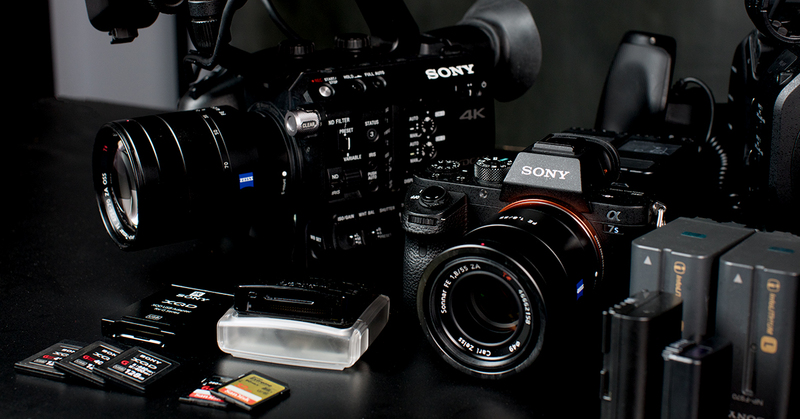 We’ve now decided to turn our attention to videography gear, and more specifically, what you can expect from battery life, recording time and so on. It’d be an understatement to say that the information below was comprehensive. We’ve gone through our entire stock of camera systems, and individually logged the recording time (per GB), as well as the battery life for each system. We’ve included a few tables of each category to this post, however, for the full breakdown of information (which will we try to keep updated going forward), click the link at the bottom of the page. Note: Record Time (Minutes per GB) represents the recording time you can get out of specific media. For example, if you’re recording to a 64GB card, you multiply the number in the column to get your total amount of minutes of record time on a 64GB card. For a Full Look Into Our Tested Recording Times & Battery Life, Click Here. – Container: MOV, AVI, … (this has nothing to do with the codec, and is a high-level wrapper for metadata, indexes, codecs, et cetera). – Codec: MJPEG, MP4, H.264 (aka MP4-AVC), H.265, … (in order of efficiency in terms of bits). – Frame types: All-I, IP, IBP, … (an All-I codec is simpler and less efficient in terms of bits). – Frame rate: 30, 60, … (frames per second). – Bitrate: Bits per second, this defines the “Record Time” in the table. Every lossy codec can be adjusted to match a bitrate at the cost of quality. The most efficient a codec, the less bits are required for the same quality. For example, MJPEG is an obsolete codec with low efficiency and it takes a lot more space for the same quality than better codecs. All these parameters are very important when comparing recording quality of different devices. Don’t fall for the common misconception that “more MB per second means better” quality, because many other parameters need to be taken into account (including sensor output quality !). Currently true, but the new Panasonic GH5 (no Panasonics listed for whatever reason) has no record limits. Good job on providing this information. One concern though, was there a reason why the Amount Sony camera’s weren’t included? I see other systems are included as some have already mentioned but just wanted to ask about the A-mount system as well. That sounds fantastic, thank you for going to such lengths to satisfy y(our) inner geek(s)! The battery field is currently more helpful on the full spreadsheet linked below the tables. We have the info filled in for more traditional video cameras, but the numbers are a lot harder to pin down for DSLR/mirrorless video use. We do plan to update the list when we get more concrete battery life information. We don’t have the battery data for DSLRs yet, unfortunately. Manufacturers don’t provide very good battery life numbers (if any) for video use. Getting those numbers will require setting a timer and exhausting the battery which will be a pretty time intensive task. We do hope to fill that info in but felt there was enough info here to provide a valuable resource until we can. I was going to say the same thing: there’s data rate information in the table, as well as battery type information, bot nothing regarding battery life, at least for internal recording (the table for external recorders does show a “runtime” column). Mother of Heaven! You guys are tireless! Thanks for doing all this work. Interesting subject, but looking into the file only the full data for the Canon M5 is provided. I am glad to see my Panasonic GM5 listed, as some time in the future the data will be provided. However since the stock batteries are only 640mAh, I usually use 3rd party 1000mAh to get more life. So that other variable maybe needed to let people know what battery was tested. Sorry if I misunderstand something here, but what you did was testing the file sizes for the DSLRs, not the battery life, right? I can’t find any information on how long I can record with a single charge on, say, a 5D IV. The headline of this post suggests that. We’re trying folks but we’ve sort of out run our coverage. The last time I did that, several years ago, it took me about 60 hours of going through spreadsheets. We’re three times larger now and I don’t have the time to do it scientifically, nor am I willing to ‘give impressions’ on something so important. We’re computerizing all of the repair information and will be back to giving those reports when we can have the computers spit out all of the data. Sony, Canon, Panasonic, Blackmagic, JVC, and Digital Recorders are all in the Spreadsheet (Be sure to click the link to the full spreadsheet containing all the info). We’re hoping to add Fuji and Nikon really soon. You seem to have only Canon and Sony data. What about Nikon, Panasonic or Fuji? Totally seconded! I miss those articles. LR >> In the past, we’ve put together an investigative piece showing the equipment that most frequently needs to be repaired and why. Sorry to be off-topic, but I’d be interested and appreciative of an update of the repair data for closer to the 2017 time frame.